When planning snowmaking systems, numerous components such as pump capacity and water quantity must be coordinated and the individual requirements of the ski area must be taken into account. This involves the consideration of local conditions and future expansion stages, among other factors. To provide a solution, the company turned to Smap3D Plant Design. TechnoAlpin designs complete snowmaking systems for use in ski areas. In general, making snow for a specific ski area takes between 70 and 80 hours. To ensure ideal snow quality and efficiency of the system, a snowmaking system must be designed with optimal precision from the start. Due to the increase in orders, the design team headed by design manager Andreas Weiss was tasked with producing a larger number of tailor-made systems in a shorter amount of time. 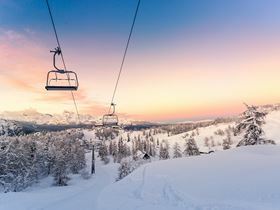 In recent years, the market has developed in such a way that ski resort operators want snow earlier and earlier, some as early as mid-October. The number of orders has increased significantly and thus also the challenges for the TechnoAlpin engineering team. Plans comprising the design of pipelines and their modifications must be generated in an even shorter time than before. This starts as early as the tender phase, since the tender includes the executed plans for the snowmaking system. Errors in these plans can have an effect on later versions. Changes in the project sequence must be possible at any time, while circumventing manual errors. Linking the flow diagram with the 3D drawing is important in this process. TechnoAlpin had another challenge to overcome: the desired software package had to be seamlessly integrated with the existing software architecture. At the same time, manual errors had to be minimized by eliminating the interfaces between process engineering and plant design, as well as between process engineering and ordering procedures, which also applies to the time required for planning and design. In the course of in-house research, the company became aware of CAD Partner’s internationally utilized solution Smap3D Plant Design. Shortly thereafter the decision was made to implement the cost-friendly solution. “In selecting Smap3D Plant Design, we are certain that we arrived at the perfect decision for our uniquely challenging requirements,” said Andreas Weiss. The adaptive Smap3D Plant Design solution, which was surprisingly quickly integrated into TechnoAlpin's existing software landscape (ERP, PDM and CAD), completely met all requirements. The speed of design and modification can now be increased by at least 20 to 25%. Due to the automated transfer of the data from the PDM system, a substantial and error-prone step in this process is eliminated. Smap3D Plant Design also allows the engineering team to transfer data from process engineering to the 3D CAD system. Shopping lists or component lists are also easy to create. Andreas Weiss is delighted with the results of the new software so far: "With the introduction of the Smap3D Plant Design solution, we are able to complete more projects in a shorter period of time, and it has significantly improved our workflow. The software solution from CAD Partner tremendously simplifies nearly 2,000 masterplans per year." Pump Centre's one-day awareness event will introduce the topic course of pumping system design.